Buy 3 get 1 Free on any Makeup Deals with this Althea Promo Code! Get your korean skincare fix with Althea vouchers. Valid for all users. 1 item in 1 redemption per user. Enjoy 15% off your first Althea purchase. Apply promo code <NEW-MY>. Limited time only. Althea Voucher: 20% off + Free gift for all users on RiRe products. Stock up on RiRe products such as cleanser, toner, essence, lotion and moisturizer. Use Althea voucher code <RIRE20> upon checkout. 1 item in 1 redemption per user. While stocks last. Take Up to 50% off on Hot Deals using this Althea Discount Coupon. Limited time only. Return to ShopBack and click through to Althea every time you are making a new transaction. Say Goodbye to Dark Circles With Help From Althea! PSA From Althea: Stop Making These Moisturising Mistakes! Althea is the leading digital destination for all things K-beauty - shopping, lifestyle, and trends. Korean beauty products have garnered widespread attention over the years with their ability to work wonders to enhance one’s natural beauty. Korean brands took the global fashion and beauty world by storm with their amazing properties. This resulted in people everywhere clamouring to find a way to purchase these products. Making this easy is Althea – the single online destination for all things Korean in Southeast Asia and worldwide. One such popular destination for Korean products is Althea Malaysia. This online store of Korean beauty products has revolutionised the concept of beauty and skincare in Malaysia with its extensive collection at low prices. Althea represents the national flower of Korea and is synonymous with delicate beauty and love. The online store aims to represent the beauty of Korea and deliver authentic K-beauty items to the world, just as the Althea flower spreads its fragrant perfume everywhere. Althea was founded in 2015 by Frank Kang with a vision to share Korean beauty with the world. Kang realised that despite the increasing popularity of Korean beauty products in the world, there wasn’t a one-stop shopping destination where everyone and anyone in the world could access them at a reasonable price. He created Althea to bring forth the best and latest K-beauty items at a discount. Keeping with this vision, Althea reinvented the cross-border distribution channel to connect K-beauty suppliers directly with SEA consumers. The company strives to become the gateway to the best Korean items worldwide. Althea offers customers access to amazing K-beauty items on its online store that are organised into easy categories in the header section of the website. Individuals can click on whichever category they want and then browse through the sub-categories to choose their products. Korea’s Trendy: For all the fashionistas and trendsetters, this category brings you the trendy items across categories for you to always keep your beauty products updated. Browse through the latest trends and fashion styles in this section. Best Sellers: For those of you not sure about the best products in each category, Althea curates all the best sellers under this category. Browse through the favourite products of the Althea community in this section. New Arrivals: This category keeps you dated with the latest beauty products and cosmetics. Stay on top of the beauty world by visiting this section from time to time and know about the latest items to set the beauty world ablaze. Brands: Brand loyalists can instantly find their favourite brands under this section. Simply scroll through the brand name or do a quick search to find all your favourite beauty products. Step 1: Create an account or log in if you are an existing customer. While you can even do this at the time of checkout, it is advisable to log in first for a smoother shopping experience. Step 2: Browse through the product categories and click the product image you like. This will open the product page where you can see all the details and information about the product. If you want to purchase the item, click on ‘Add to Bag’. Step 3: You can add additional products the same way and review your purchases by clicking on the ‘BAG’ located on the top right of the site. In this page, you may review your purchases before you confirm the order. Be sure to check your orders, and if you have a coupon code, don't forget to key in the code. Once you're happy with your purchase total, you can click CheckOut! Step 4: Check your billing details and choose a payment method. 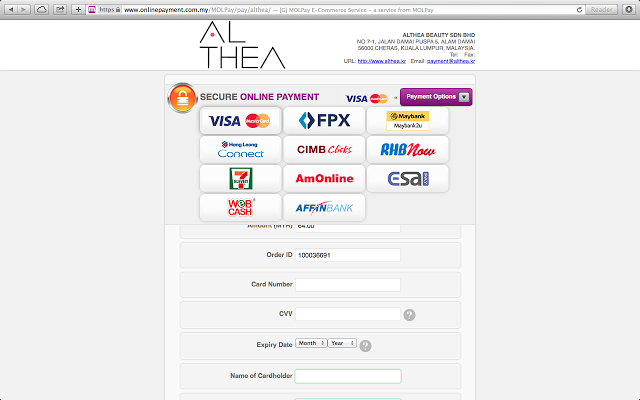 Althea Malaysia uses the MOLPay Malaysia Online Payment Gateway for payment through Visa, Master Card, and popular E-banking services. In addition, you can even opt for PayPal. Step 5: Once the payment method is selected, you can review your order (apply Althea coupon code if applicable). Click checkout to finalise your order. Step 6: Althea will send you a confirmation email notice once your order is completed and ready for shipping. Once you have received your products, you can also be featured on Althea’s beauty wall by uploading pics of your product with the Hashtag #FeaturedOnAlthea. Althea constantly strives to make K-beauty solutions available at affordable prices. To facilitate this and offer customers the best deal on the products, Althea constantly offers customers discount codes, Althea coupons, free product delivery and several sale offers. The website also has a dedicated sale section on the main page where customers can find exciting coupons and promotion codes across products. Here there are items from different categories available at popular Althea discount prices. To be the envy of all your friends with the best K-beauty products without burning a hole in your pocket, be sure to visit this section often. New customers also receive several benefits when they sign up such as a coupon code as a welcome gift along with exclusive access to Althea promo deals. Along with constant deals and offers, Althea customers can also enjoy the benefit of an exclusive promo, voucher or discount code during the festive season with the 11.11 sale, Christmas sale and Diwali sale among others. Online shopping Up to 7% cashback Shop online for products ranging from beauty, cosmetics, skincare, makeup, mask and many more on Althea. Step 1: Visit the ShopBack website and click on the Althea Malaysia store at the bottom of the homepage. You can also use the search box to find the link to the Althea store. Step 3: If you are interested in finding attractive Althea coupon codes and deals, check out the Althea promo codes, vouchers, discount codes & coupons section. Step 4: You will be redirected to the Althea website to browse and select the items. The cashback offer is not applicable on purchases made on the Althea app. Althea isn’t just revolutionising the way people across the globe use beauty products but also ensuring easy accessibility of genuine articles. The company ships Korean products across the world seamlessly and even offers free shipping on orders above a certain value. International shipping fees may vary due to weight or size of the parcel. In case of a purchase order more than RM99 (in a single order) Althea will provide free shipping and the parcel will be delivered via Poslaju/ Skynet or Gdex. International shipping from Korea takes 10 to 15 days from the time the order is placed till it is delivered. Shipping is done from Monday to Friday, except on Malaysian and Korean holidays. Althea is committed to delivering only high-quality and authentic products by hand picking and selecting every single item directly from brand owners and reputed suppliers. However, in case a customer receives a non-authentic product, Althea offers to refund 200% of purchase value to the customer. To claim a refund, one simply needs to drop in an e-mail to the customer care and they will respond on the same at the earliest. Althea offers its customers the best price possible for all products by eliminating middle men and sourcing all the products directly from Korea. All prices mentioned on the website are inclusive of taxes enabling customers to see the final cost they need to pay. As Althea works directly with brands and reputed Korean suppliers, they are able to eliminate overheads in the distribution channel and pass on the savings back to the customers. Items bought during promotional events are not accepted for returns and/or exchanges. Customers will have to bear the postage fee when shipping the product back to Althea. After this, they will be refunded a maximum of RM6 towards return charges. However, international shipping charges of RM30 paid by the buyer at the time of purchase are non-refundable. Once everything has been found to be in order, Althea will refund the money after a minimum of 7 working days. Althea also ensures high-quality of all its products by carefully monitoring every single item from the time it enters the warehouse till it is shipped. The company directly hand picks and packs from Althea’s warehouse and delivers only after checking the expiration date and authenticity of every single parcel. For customers’ buying different items at the same time, Althea delivers the entire bundle of items at the same time. This eliminates the need to wait for each item at a separate time. In addition, all orders above RM99 can enjoy free shipping adding to the excitement of shopping online. Althea also allows for easy access to customer care in case of any concerns. 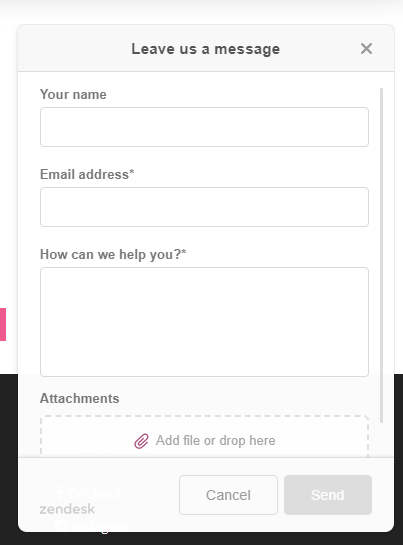 There is a ‘Help’ button on the bottom right of the page where customers can click and fill in their message. In addition, customers can also click on the ‘Contact us’ tab at the bottom of the page and be directed to a form. Once filled with all the details, the customer care team will get back with a solution at the earliest. For inquiries customers can also e-mail the customer care team at help@althea.kr. To stay updated about the latest Althea news and product additions, customers can also follow them on social media or their blog. These channels are also a great way of staying updated about latest coupons, deals and promotion offers for added savings. Connect with Althea through any of the following. For all your other makeup needs, Shopback has you covered. Head on over to Shopback where you can find coupons, discounts and cashback from other makeup stores such as Sephora and Hermo.